Antibodies isolated from HIV positive individuals were successful in preventing proliferation of HIV in animal, while it was not preventing HIV in the infected individuals. What is that difference that antibodies work against HIV in animal model, is now key towards development of a successful vaccination program against HIV. HIV virus infect B cells which impart protection by developing immunity against any kind of infection in our body. HIV infects and destroy B cells in our blood. Also HIV change genetic material, DNA of infected human B cells and use these cells for making copies of new HIV virus. Why vaccine is not completely developed so far because HIV changes its outer protein coat sequence, frequently so that a vaccine against protein coat of HIV is not successful, it may work in one individual while it may not work in other. How ever there was a finding that Antibodies produced in people which are infected with HIV can protect animals from developing HIV infection and disease AIDS. Therefore it is possible to develop a vaccine which will work in human model as well. Team of scientists working with NIH have found a way for developing a successful vaccine against HIV, by combining step by step stimulation by combining three different proteins which will work as antigen and elicit immune response against HIV. Combining above proteins for immunization in step by step manner may protect human against HIV infection. 1) VRC01 are antibodies which binds with trimeric gp120 region and inhibit attachment of virus to human B cells. 2) BG505 SOSIP: Are two more similar kind of protein which binds with HIV and neutralize its ability to infect B cells. 3) eOD-GT8 60mer is a nano-particle protein, it is found that this elicit immune response where above two proteins could not, it help in stimulation and then production of precursors required to produce antibodies against HIV. Director of National Institute of Health United States, Dr. Francis Collins have expressed his hope for success for these strategy over his blog. Biomarker that will help predict if a person will develop fetal lung disease associated with TB infection and can be used to treat Mycobacterium tuberculosis infection. Every individual who encounter Mycobacterium tuberculosis infection do not develop an active form of TB, such individuals may test positive for Mycobacterium tuberculosis infection or antibody test. A protein interleukin-32 is found in such individuals which protect them from developing TB infection into an active form of TB or fetal lung disease. Interleukin-32 help immune cells of body to kill Mycobacterium tuberculosis bacteria in presence of Vitamin D. Vitamin D is very important for protecting individual from developing active form of TB, in presence of Vitamin D protein interleukin-32 induce killing of Mycobacterium tuberculosis. Presences of biomarker interleukin-32 in patients with latent TB can be used to predict if such patients will develop active form of TB or never. Synthetic Interleukin-32 can be used to develop pharmaceutical substance to treat TB patients with deficiency of interleukin-32 as well. HIV neutralising antibodies for passive immunization. Advanced treatment of HIV infection with HIV neutralizing antibodies under development. Anti retroviral drugs must not be discontinued so as to keep HIV viral load under control to maintain quality of life, still many patients discontinue taking drugs for many reasons like anti retroviral drugs have their own set of side effects and complications, availability. Now such patients have better option as scientists from National Institute of Health United States of America have developed broadly active antibodies against HIV, which are tested in patients who have discontinued their medicines and were able to lower viral loads, in laboratory study it is proven that new CD4 cells were not infected by HIV virus in presence of these antibodies incubated for sufficient time. These antibodies are Broadly neutralizing antibodies (bNAbs) which are called as PGT121, VRC01 and VRC03. These antibodies can be used for immunization for patients and healthcare personals at high risk. Combination of these antibodies along with HAART will help in reducing drug load and their side effects after prolonged use. New class of antiretroviral drug being developed that destroys HIV infected human cells hidden deep inside tissues. Bacterial toxin which can eliminate tissue cells responsible for proliferation of HIV. If you refer this page you will come to know that there are drugs available to treat HIV virus infection by attacking almost at all stages of infection of HIV (mode of action) except one point, that is destruction of HIV carrying human cells, there is no drug available which can find out HIV infected tissue cells and destroy them. Getting such drug would be a great breakthrough towards complete removal of HIV from human body. A first step towards development of this novel class of antiretroviral drug is made by Dr. Edward A. Berger of (National Institute of Health) NIH’s National Institute of Allergy and Infectious Diseases (NIAID) and Dr. Ira Pastan of NIH’s National Cancer Institute (NCI). To understand how this drug will work it is important to understand how HIV virus infects and multiply. During infection process HIV virus first attaches to a Human CD4 cell and inject its RNA in to human CD4 cell; HIV RNA is converted in to DNA strand which is capable of transcribing HIV proteins essential for multiplication of HIV. This DNA get permanently attached to human DNA of human CD4 cell, and convert this human cell in to a HIV virus factory. Therefore even though there are drugs designed to kill HIV virus at all stages, these HIV producing human cells are alive inside human body hidden in various tissues, which becomes active as soon as antiretroviral drug therapy is stopped. Therefore to eliminate HIV DNA carrying human cells is equally important to achieve complete removal of HIV virus from human body. Cytotoxic HIV-specific immunotherapy is found to destroy human cells responsible for reproduction of HIV in is a toxin derived from bacteria and is known as immunotoxin 3B3-PE38. This toxin was found to be effective in reducing the HIV viral load in humanized rat model. It was found that dose of immunotoxin along with antiretroviral drug therapy (ART) was successful in reduction of HIV loaded or HIV DNA carrying CD4+ T cells, macrophages and thymocytes. Until 13-Aug-2013 there was only one drug Raltegravir available under the class of HIV integrase strand transfer inhibitors, on 13-Aug-2013 US FDA approved one more drug Tivicay (dolutegravir), HIV integrase strand transfer inhibitor to treat HIV infection. It is found to be effective in patients which develop resistance to earlier available drug Raltegravir and for patients who have not yet received any HIV drug therapy. In-order to control the viral load, drugs which inhibits the almost all stages of infection are used. This is the base for combination therapy. Drug Tivicay (dolutegravir) belongs to HIV integrase Inhibitor. Drug Tivicay (dolutegravir) is approved by US FDA under fast track approval process for drugs, its efficacy and safety was evaluated in clinical trial conducted on 2,539 patients, Tivicay (dolutegravir) was given along with Atripla, a fixed dose combination drug which contain efavirenz, emtricitabine and tenofovir, and results were found satisfactory in reducing HIV viral count and increasing CD4 counts in participants taking Tivicay (dolutegravir), it showed satisfactory results in reducing viral load, patient aged 12 year with at least 40 kg who has not taken any anti retroviral drug therapy ( Treatment Nave ) were also shown reduction in viral count. Drug Drug Tivicay (dolutegravir) is also been studied for use along with Abacavir and Lamivudine, in a new new fixed dose combination for its effectiveness and safety in reducing HIV viral count. 1) Nucleoside Reverse Transcriptase Inhibitors (NRTIs) : In this class there are about thirteen drugs available. 3) Protease Inhibitors (PIs) : In this category 10 Drugs are available. 6) HIV integrase strand transfer inhibitors : Two drugs are available. Second botanical drug approved by US FDA for symptomatic relief from diarrhea associated with HIV infection and its drug treatment. Symptomatic relief form diarrhea incase HIV infection, is very important for continuation of antiretroviral drug therapy, as antiretroviral drug therapy itself can cause diarrhea , and it is one of reason why many tend to stop HIV drugs just to get relief from symptoms of diarrhea. US FDA has approved new drug Fulyzaq (crofelemer) for symptomatic relief from non-infectious diarrhea in adult patients on antiretroviral drug therapy. Fulyzaq (crofelemer) is a novel drug which is second most FDA approved herbal drug (drug from botanical origin) for symptomatic relief from diarrhea associated with HIV infection. Fulyzaq crofelemer is derived from latex of Croton lechleri Müll, and it is an oligomer , consisting subunits of , (+)-catechin, (-)-epicatechin, (+)-gallocatechin, and (-)-epigallocatechin linked to each other. Excessive water secretion in bowel causes diarrhea, it is because of excessive secretion of sodium ions and other electrolytes secretion in bowel, as a result patient suffer consistent watery bowel movements. Drug crofelemer has unique property of blocking secretion of chlorine and calcium in to GIT and which reduce secretion of sodium and other electrolytes in bowel resulting in less amount of water secretion inside GIT and to protection from symptoms of diarrhea. Drug crofelemer blocks cyclic adenosine monophosphate (cAMP) stimulated “cystic fibrosis conductance regulator and calcium activated chloride channel” in GIT, the effect of drug is measured by presence of stool chloride ion. Before starting the drug Fulyzaq (crofelemer) it should be confirmed by test that diarrhea is non-infectious (not caused by bacterial, fungal or viral infection in GIT). Diarrhea lasting for many days is one of symptoms of AIDS. Opportunistic infections and drug or antibiotics used to treat HIV infection and infections associated with HIV are responsible for causing diarrhea, sometimes drug resistance caused by drugs are responsible for growth of resistant Clostridium difficile infection which is one of cause for diarrhea related to HIV infection . New intermediate protein which facilitate attachment of HIV over CD4 and its 3D structure reveled. An intermediate temporary protein found in the process of infection of HIV virus to CD4 cell, this protein can be used in the development of vaccine against HIV. This temporary protein is occurs just before the attachment of HIV virus to CD4 cell. The finding of this intermediate protein is very important for further development of antiretroviral drugs and vaccines; this can be very successful target for developing antiretroviral drug of category attachment inhibitors, and for further developments of neutralizing antibodies against HIV, and HIV vaccine as well. The process of infection of HIV to CD4 cell is a complex one, it involves various steps, there are proteins over HIV core which first unbound and attach themselves over CD4 receptors over surface of lymphocytes followed by penetration and so on. Developing a vaccine against HIV, which when given to human can stimulate development of antibody response in human body against incoming HIV infection through out human life, which will successfully protect human from incoming HIV virus infection is still a dream , which is yet to be achieved since the protein envelop of HIV keep on changing, Still there are certain points over HIV virus envelop which do not change but they are hindered by proteins preventing their presentation to immune system. 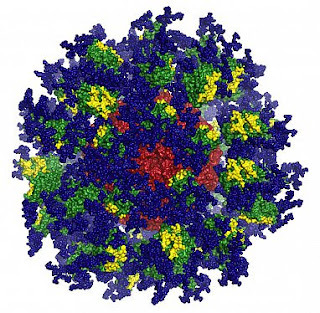 To overcome these hurdles in developing HIV vaccine a team from NIH's National Cancer Institute (NCI) led by Dr Dr. Sriram Subramaniam studied the structures of all proteins in the process of HIV infection, they used a technique known as cryo-electron microscopy where in the whole virus or purified viral proteins are frozen rapidly so that the Ice stays liquid like, in this technique proteins do not alter in there special orientation and do not get any damage still making available as rigid sample for observation this special frozen sample enable us to see the life like images of these proteins when observed under electron microscope. Dr. Sriram Subramaniam and his team compared there dimensional structure of HIV virus envelop as well as protein which binds with CD4 receptor as well as to an antibody which mimics CD4 co- receptor, it was found that when HIV envelop is bound by any one of receptor the gycoprotien is transformed in to an activated state where 3 helical spring out in the center of HIV envelop, This activated protein is found between inactive position (which is not bound) and the immediate next structure of HIV Envelop, which occurs just after fusion. Dr. Sriram Subramaniam and his team also studied portion of HIV envelop which binds with HIV neutralizing antibody VRC01 which were recently discovered in Aug 2011 and are capable of neutralizing many HIV strains. With these findings we will have information of events and proteins facilitating infection of HIV, just prior to HIV attachment to cd4 receptor. Protein which can inhibit HIV virus attachment and entry in to new CD4 cells. Protein derived from platelet is found to exhibit broad spectrum HIV inhibitory properties. There are few sites over HIV virus which are unique and have great potential as targets for new drugs and HIV neutralizing antibodies, these sites so far are not explored as new targets for new antiretroviral drugs, now this research finding will certainly open doors for development of drugs and HIV neutralizing antibodies which will be able to stop progression of HIV infection and disease. Scientists at National Institute of Allergy and Infectious Diseases (NIAID), ( NIH) have discovered a protein called as CXCL4 (PF-4) in blood samples of people infected with HIV , it was fund that this protein binds with HIV virus and it do not allow HIV virus to infect new lymphocyte or CD4 cell, as HIV virus attachment to new CD4 cell and penetration steps in the process of HIV virus infection are blocked by this protein CXCL4. CXCL4 or (PF-4) protein is a chemokine, which are known to facilitate transformation of immunological cells in tissues. There are four chemokines , of which three chemokines were found by Dr. Lusso, Robert Gallo, M.D and his team, these chemokinines along with CXCL4 have capability to bind HIV virus and inhibit its progression. CXCL4 bind with outer protein coat of HIV virus at a site which is very different than other sites on HIV virus where drugs and HIV antibodies bind, Dr. Lusso, Robert Gallo and his team is working with scientists at NIAID Vaccine Research Center for identifying and locating structure of this site by atomic level crystallography. This site may be very helpful in further developing a drug and HIV vaccine which specifically target this site. CXCL4 protein has capability to bind on variety strains of HIV virus, CXCL4 protein is made by platelet. Dr Lusso and his team is now engaged in finding further how this finding on chemokines and CXCL4 can be used to develop new options for HIV neutralizing antibodies or vaccine or an antiretroviral drug which can target specifically at binding site of CXCL4 over HIV. Antibodies of class Immunoglobulin G (Ig G ) increase protection in HIV vaccine trail, provide a clue for future development of HIV vaccine . Any vaccines work by inducing production of antibodies against any infective microorganism in our body Incase of HIV, antibodies produced are not able to stop or kill HIV virus as HIV virus proteins keep on changing due to high rate of mutation and keep on presenting variations so that induced antibodies incase of HIV do not confer complete protection against HIV. Now in a new research conducted by researchers led by Dr. Barton F. Haynes from Duke University, it is found that higher concentration of particular antibodies belonging to class Immunoglobulin G (Ig G ) have imparted increased protection in individuals who had participated in a clinical research on HIV vaccine conducted at Thailand in 2009, about 1600 volunteers participated in clinical trial on HIV vaccine. About 31 % population which received an experimental HIV vaccine had lower chance of getting HIV infection compared to individuals given only placebo control group. Dr. Barton F. Haynes of Duke University and his team analyzed serum samples from 246 vaccinated volunteers and it was found that there is higher concentration of Ig G concentration in individuals which showed increased protection, and there was high concentration of Ig A antibodies in volunteers which were not shown protection. Ig G antibodies attach to variable regions V1 V2 on gp120 protein which help HIV virus in the process of attachment to host cell. Increase concentration of Ig A antibodies in individuals which did not show any protection might be due to hampering of activity of Ig G antibodies, by attaching at C1, first constant region. NIAID Director Dr. Anthony S. Fauci has expressed hopes for developing a successful vaccine against HIV in near future by using present findings.